Most trips to Sweden start with at least a few days in Stockholm. There are a lot of things to do in Stockholm, so we spent a total of four days in Sweden’s capital city. 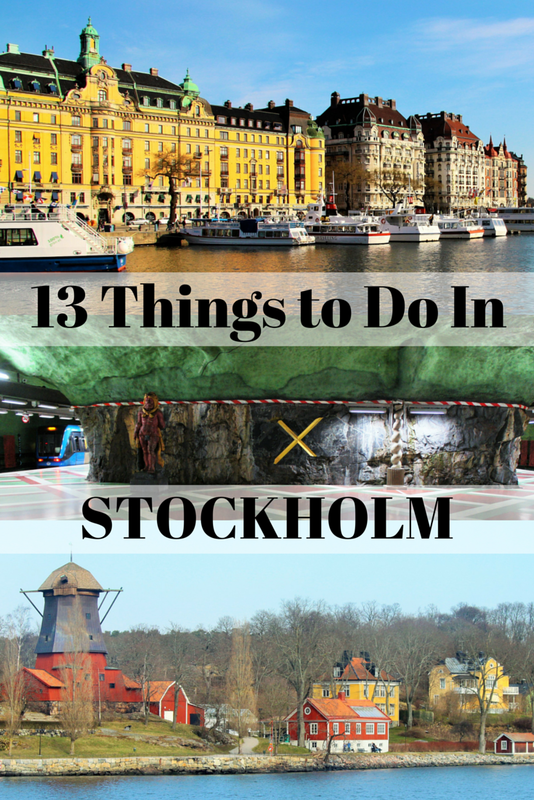 These Stockholm attractions can be visited all year long; we enjoyed them in winter. What we loved about Stockholm was the variety of things to do and see. Stockholm’s attractions aren’t all art museums or churches, but a great mix of interesting sites. We have compiled a list of what we felt were the top 13 things to do in Stockholm categorized by neighborhood. Ask anyone in Stockholm what you should see while in the city and they will immediately tell you to visit the Vasa Museet. This museum is devoted to one thing, and one thing only, the warship Vasa. The story of Vasa is incredible, mostly because, while tragic, it left us with something we would never have otherwise. The tragedy allowed us to be able to see the most intact and well-preserved warship from the time, as what remains is 98% original. The warship Vasa was built in 1628 and sank 20 minutes into its maiden voyage. This impressive ship was commissioned by the king because Sweden was at war with three countries. The ship was covered in over 500 sculptures and painted in bright colors with the intention of striking fear into all who would see it. It is believed Vasa sank because it was too narrow and too tall. Vasa had 150 to 200 people on board for its maiden voyage, which included families of the ship builders and crew. All of the gun ports close to the waterline were open and when the ship started to list water rushed in and started to sink the ship. Vasa sank in 32 meters of water with its mast still sticking out of the water and 37 passengers, both men and women, trapped inside. The Vasa was lifted out of the water in 1961 and the preservation process began and continued for 17 years before the museum opened in 1990. In addition to the ship, which can be viewed from multiple levels, the Vasa Museum displays items saved from the ship like cannons, a ring, and some of the bodies. Guided tours providing information about the ship are provided, which we highly recommend, as well as a film about the preservation process. The ABBA: The Museum may be the most awesome museum of all time. If you like ABBA that is. But who doesn’t love ABBA?! What makes this museum fabulous is not just ABBA, but also that it is an incredibly fun interactive museum. Your entrance ticket is your ticket to fun. Throughout the museum, there are interactive exhibits where you scan your ticket and then pretend you’re in the recording studio, recording a music video, or performing on stage with the band. When you get home you can enter your ticket number into the museum’s website and look at your scores and watch videos that were created. Of course, there’s also a lot of ABBA history throughout the museum including documentaries, the band’s recording studio, ABBA’s unique costumes, and more. The ABBA museum motto is “Walk in. Dance out.” This is exactly what will happen. Skansen is the world’s first open-air museum and was founded in 1891. Skansen illustrates five centuries of Swedish history with traditional buildings and farmsteads from all over the country. Skansen is 75 acres of living history with gardens, Scandinavian animals, and guides in traditional costumes who can be found throughout the park ready to share a little piece of history from the location and time period they represent. We visited Skansen on a pretty cold day, so it was nice to be able to enter some of the homes and farmsteads to find a warm fire. Since it wasn’t very crowded that day, I think the guides were happy when someone walked in the front door too. One of my favorite stops in Skansen was Skansen Glassworks. Glassblowing is demonstrated for visitors and the shop sells the items made. Across the street from Skansen and next door to the Vasa Museum is Nordiska Museet, Sweden’s largest museum of cultural history which was founded in 1873. The ground where the museum stands was broken in 1888 by the museum’s founder, Artur Hazelius, and the huge museum took 19 years to build and was inaugurated in 1907. While Skansen shows what life was like throughout Sweden’s history by showing where and how the people lived, Nordiska Museet displays what Sweden’s people had in their homes like furniture, textiles, fashion, jewelry, china, and even food. One of my favorite parts of the museum was that of holiday table displays through time. The Spritmuseum is another one of Stockholm’s fun interactive museums. While the original museum opened in 1967 featured the production of alcohol, the new museum opened in 2012 focuses on how alcohol affects people. The Spritmuseum walks visitors through the seasons and provides the opportunity to touch, taste, and smell. A self-guided tour of the museum is complimented by the Smaklåda tasting box which contains schnapps and snacks. Exhibits throughout the museum will let you know when it’s time to taste items in your box at the same time you’re learning about them. There are also quizzes and games scattered through the museum along with random things like a room that makes you feel like you have a hangover. The Spritmuseum also has one of the best museum restaurants in the city. The Royal Palace of Stockholm is the official residence of the King and Queen as well as workplace and historical monument. The palace is open to visitors year-round and the best way to visit the Royal Palace is to join one of the guided tours which are included in the entrance fee. The current palace was built in the early 1700s by architect Nicodemus Tessin who studied under Bernini and designed the palace in the Roman style. The current palace is the third to have stood on the site, with the first being a Viking fortress built in 900 AD and the second which burned down in 1697. In addition to touring the royal apartments, visitors on the guided tour will learn interesting facts about Swedish history, like the fact that King Charles XIV John of Sweden was originally Jean Baptiste Jules Bernadotte, a French General who was elected to be the King of Sweden when there wasn’t an heir to the throne. Speaking of thrones, the silver throne in the palace might look familiar, as a replica of it appeared in the 1933 Greta Garbo movie Queen Christina, and later as the Joker’s silver throne in Batman and again in Charlie and the Chocolate Factory. Visit the Royal Palace’s website for current opening hours and tour times. Stockholm Cathedral is Stockholm’s oldest building. The earliest mention of Stockholm Cathedral was in 1279 and the oldest part of the currently standing brick church was consecrated in 1306. The church reached its current size in the 1480s, but the exterior was rebuilt between 1736 and 1742 to match the recently rebuilt Royal Palace. One of the prominent features of Stockholm Cathedral is St. George and the Dragon, a sculpture ensemble consecrated in 1489 carved out of oak with details made with elk antlers and horsehair. On the condition that the town’s inhabitants convert to Christianity, St. George saved the heathen town of Selene by killing a dragon that demanded human sacrifices. Sten Sture the Elder commissioned the sculpture, probably identifying with St. George as he saved Stockholm from Denmark when the forces of King Christian tried to invade. Stockholm Cathedral also has more modern additions like the candle globe, added in 1972 and used as an assembly point for prayers for the world. Alfred Nobel was a Swedish chemist and the inventor of dynamite. It is believed Alfred Nobel didn’t want to be remembered for creating something that killed people, so with his will he established the Nobel Prizes which were to be awarded annually along with a monetary award to world citizens in five categories: physics, chemistry, physiology or medicine, literature, and peace. A visit to the Nobel Museum starts with an introduction to the most recent Nobel Laureates. Towards the back of the museum during our visit were chiffon draped walls playing short interviews with Nobel Prize winners while overhead a cableway was constantly moving displaying portraits of the over 800 Laureates awarded prizes since 1901. Also on display are Alfred Nobel’s last will, pictures, and artifacts as well as a display of the place settings used at the Nobel banquet. Stockholm’s City Hall, or Stadhuset, can only be visited with a guided tour. It is where city business occurs and the city council meets. What is probably even more interesting to visitors is that the City Hall of Stockholm is the location of the famous Nobel Banquet every year. While the building gives the impression of being a few hundred years old, it was actually completed in 1923. It was built in the “national romantic style” which means the architecture was inspired by Italian architecture and the materials all came from Sweden. Guided tours lead visitors through the various halls of City Hall. The first is the Blue Hall, which isn’t blue at all, but is the location of the annual Nobel Banquet where 1,300 guests gather to dine. The tour also visits the hall where the 101 city council members meet under a boat shaped ceiling painted in deep blue and orange. As some of the smaller halls of City Hall are very popular for weddings, try to avoid taking a tour on Saturdays as these will very likely be closed off. The tour ends in the Golden Hall, completely covered in gold mosaic tiles. After the Nobel Banquet, guests ascend to the Golden Hall for dancing. The artist behind this hall was widely criticized for a number of his choices and mistakes, and your tour guide will point these out and tell the tales behind them. The Hallwylska Museet is quite an eccentric museum. The Hallwyl Museum was built in 1898 as the summer home of Count and Countess Walther and Wilhelmina von Hallwyl. There were no budget restrictions, so the Hallwyl house is one of the most expensive private residences ever built in Sweden. What makes the museum so unusual is that the Countess decided while she was still alive and living in the residence that she wanted it to become a museum. To that end, every single piece in the house, from the furniture to the dishes to her jewelry, was cataloged in multiple volumes of books and the house remains exactly the same as when the family lived there. It is said that even when the Countess went to the theater, small metal tags hung off of her clothing and jewelry as it was already cataloged. This eccentricity helped create something that rarely happens, a house museum that actually displays its original furnishings rather than just furnishings from the time period. The Hallwyl Museum can be visited on a self-guided tour, but joining a guided tour will provide access to additional rooms which can’t be visited alone. Enjoying a brunch buffet aboard the S/S Stockolm is a great way to kill two birds with one stone. On Saturdays and Sundays Strömma Kanalbolaget offers cruises through Stockholm’s archipelago accompanied by a traditional Swedish smörgåsbord. The cruise is three hours, departs from Strandvägen, and heads northeast through Stockholm’s islands all the way to Vaxholm before returning. As the islands pass by through the window, cruisers can feast on the smorgasbord. Smorgasbord began when the snaps table of snacks and snaps began the dinner. The tradition grew bigger and in 1939 went international at the New York World’s Fair. Now smorgasbord is traditional in Sweden on holidays like Christmas and Easter. On the cruise it is recommended to enjoy the Swedish smorgasbord in six courses: herrings and eggs, fish and shellfish, cold cut meats and salads, hot dishes, cheese, and desserts. Stockholm is a very walkable city, with bridges connecting islands and new sites to see around every corner. However, sometimes you’ll want to take the subway, not just to get somewhere faster, but mostly to see some of the stations’ subway art. Stockholm’s subway system has even been referred to as the world’s longest art exhibit. The two most impressive subway stations we visited were Kungsträdgården and T-centralen, both on the blue line. The Kungsträdgården subway station is made to look like an archaeological excavation of the Makalös palace. The first thing we did when we arrived in Stockholm was partake in the Swedish tradition of fika. The Swedes drink a lot of coffee, but fika isn’t just about having a cup of coffee. Fika is a time to bond with others over a cup of coffee and a sweet and is practiced daily, if not multiple times a day. We used our first fika experience to immerse ourselves in the Swedish culture and the Swedish caffeine so we could spend a day of sightseeing after our 18-hour flight. One of the best places for a fika experience in Stockholm is Chokladkoppen, which is conveniently located for travelers in Gamla Stan, the old town of Stockholm. The perfect accompaniment to a mochaccino is a kanelbulle, a classic Swedish cinnamon bun seasoned with cardamom. Chokladkoppen serves sandwiches and hot dishes in addition to coffees and sweets. Travel Tip: All of the attractions listed in this post, other than ABBA: The Museum and the brunch portion of our cruise, can be enjoyed using the Stockholm Card. The Stockholm Card provides free admission to over 75 museums and attractions, free sightseeing by bicycle and boat, and free travel using Stockholm’s public transit system. You can see all the Stockholm Card covers and purchase one online from Visit Stockholm. Thank you to Visit Stockholm for hosting our travels through Stockholm and making this post possible. As always, all opinions are my own.